I love Middle Eastern cuisine. Love it. I think I have Persian blood.... Not really. But, anything that says curry, tabbouleh, naan, or tzaziki I want it. In a pot, bring 2 cups of water to a rolling boil. 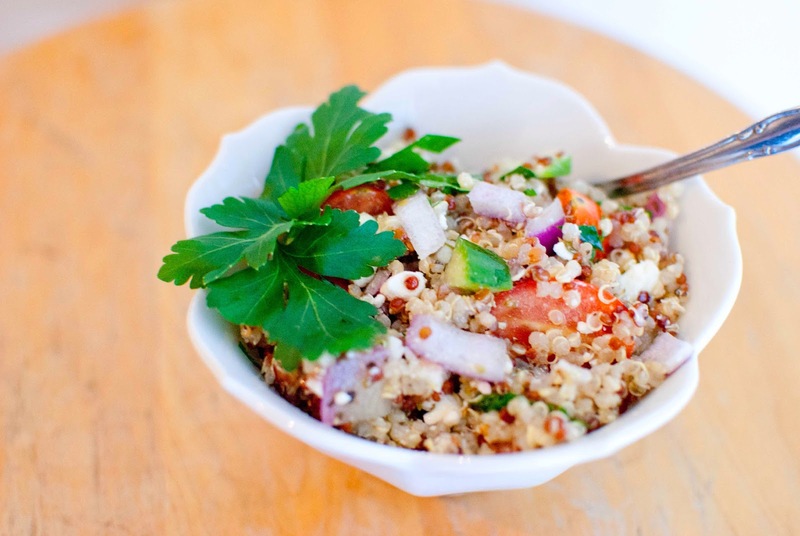 Once it is nice and bubbling, add 1 cup of Quinoa. I used both white and red. Use whatever you have! Turn the heat down to low and cover for 20 minutes. No peaking! 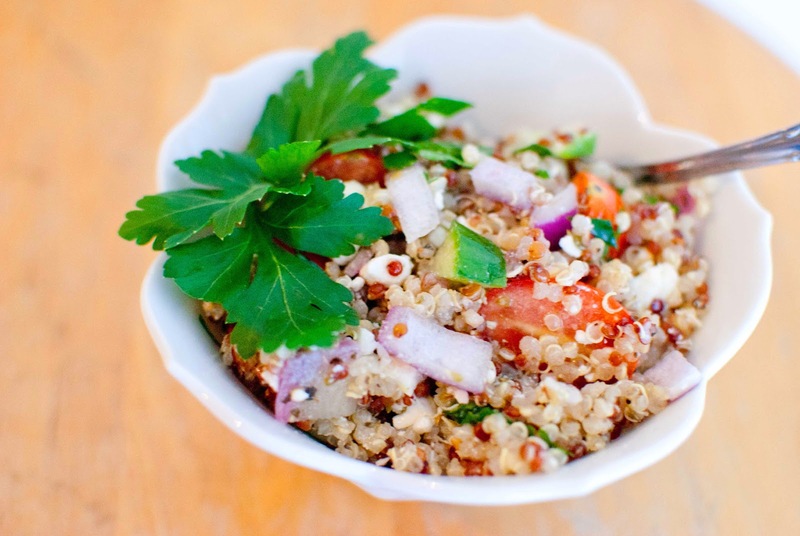 Quinoa cooks just like rice. While your seeds are cooking, make the "dressing" - you can find countless recipes online, but here is how I make mine. I change it every time I make it, so it depends on the day, and what I have on hand. 1/2 cup EVOO - the good stuff! Mix all these together with salt and pepper. Mince up a handful of parsely and mint and add to the dressing. Now you need to chop up half a red onion, half an english cucumber, and half a pint of cherry tomatoes. Add these to your dressing and toss. When the quinoa is done, fluff with a fork and add to the vegetables and sauce. I add it after it finishes cooking - you could wait till it comes to room temperature if you aren't in a hurry. Place in an air tight container and put in the fridge. I like to serve it cold - or almost room temperature. Is a perfect side dish to kebabs and naan! Enjoy this healthy, protein-packed dish! Your body will thank you. This sounds totalyl delicious! 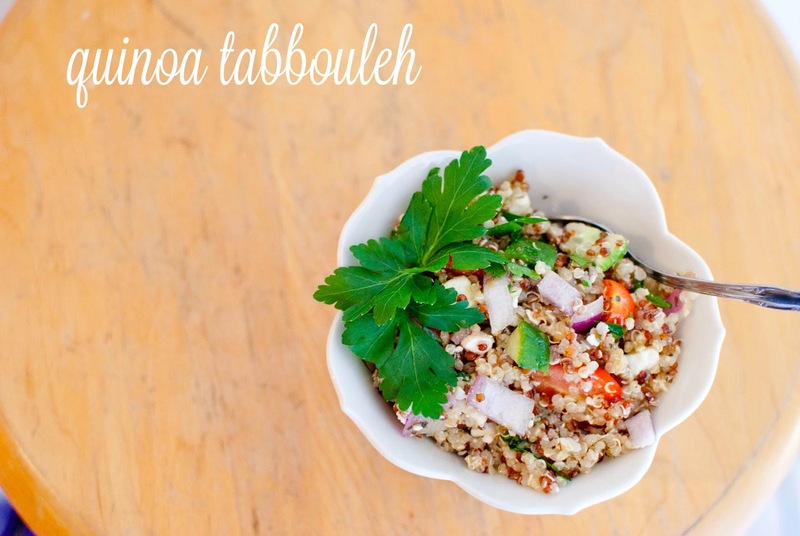 I'm on a huge quina kick & this sounds perfect (& it's healthy!). I might just end up making it this weekend... :) Oh, and your photos are gorgeous! Thanks, Ashley! It is super super yummy, makes a great "staple" for the fridge.